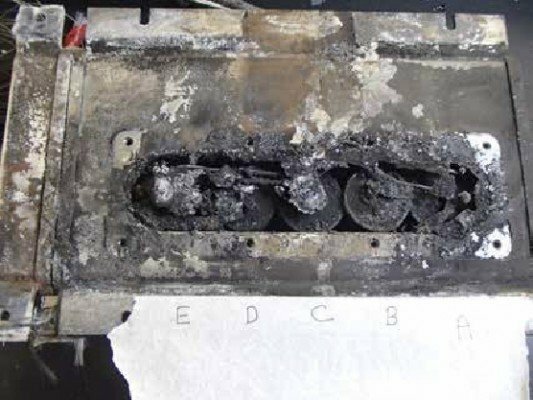 An ELT battery fire on an Ethiopian Boeing 787-8 at London-Heathrow Airport was likely caused a short-circuit caused by improperly installed battery wires, leading to a thermal runaway. The U.K. AAIB published a Special Bulletin containing information on the progress of the investigation into a ground fire on an unoccupied Boeing 787-8, registration ET-AOP, at London Heathrow Airport on 12 July 2013. Examination of the aircraft’s ELT revealed that the internal battery pack had experienced severe disruption, exhibiting evidence of a very high-energy thermal event, consistent with having experienced a thermal runaway. All five cell cases had been breached and burnt battery material had been ejected into the battery compartment and outside of the ELT case. The AAIB reports that the most probable cause of the thermal runaway was a short-circuit caused by improperly installed battery wires, leading to an uncontrolled discharge of the battery. It was established that this condition in isolation should not have caused a battery thermal event, if the battery short-circuit protection features had effectively limited the current to a safe level. In addition, the failure sequence would have required one of the battery cells to deplete more rapidly than the others until it reversed polarity, becoming resistive and absorbing energy from the other four cells as they discharged and ultimately resulting in thermal runaway of the depleted cell. Several tests demonstrated that when a cell failed in this manner, the heat released caused the failure to cascade to the remaining four cells. It is recommended that the Federal Aviation Administration develop enhanced certification requirements for the use of lithium-metal batteries in aviation equipment, to take account of current industry knowledge on the design, operational characteristics and failure modes of lithium-metal batteries. It is recommended that the Federal Aviation Administration require that electrical performance and design-abuse certification tests for lithium-metal batteries are conducted with the battery installed in the parent equipment, to take account of battery thermal performance. It is recommended that the Federal Aviation Administration work with industry to determine the best methods to force a lithium-metal cell into thermal runaway and develop design-abuse testing that subjects a single cell within a lithium-metal battery to thermal runaway in order to demonstrate the worst possible effects during certification testing. It is recommended that the Federal Aviation Administration require equipment manufacturers wishing to use lithium-metal batteries to demonstrate (using the design-abuse testing described in Safety Recommendation 2014-022) that the battery and equipment design mitigates all hazardous effects of propagation of a single-cell thermal runaway to other cells and the release of electrolyte, fire or explosive debris. It is recommended that the Federal Aviation Administration review whether the Technical Standard Order (TSO) process is the most effective means for the certification of lithium-metal batteries installed in aircraft equipment, the actual performance of which can only be verified when demonstrated in the parent equipment and the aircraft installation.